Monaci delle Terre Nere è una tenuta ai piedi delle pendici dell'Etna di cui i proprietari "Guido ed Ada", si sono innamorati facendola diventare una lussuosa boutique hotel di campagna con vista sul Mar Mediterraneo e sul famoso vulcano. Immersa in 24 ettari di verde, è uno dei soli cinque resort certificati eco-bio in Sicilia, con vigneti, uliveti ed un'azienda agricola biologica al servizio dell'hotel con prodotti di produzione propria. Una location perfetta e suggestiva per matrimoni in quanto offre con 23 spaziose camere e suite, una piscina, un raffinato ristorante, un bistrot, un bar, un bar a bordo piscina, un orto, una magnifica terrazza ed un parco giochi per bambini . È il luogo perfetto per le coppie in cerca di un ambiente davvero unico e la tranquillità di avere un team dedicato per rendere indimenticabile la giornata. Dal coordinare la cerimonia con la sala del municipio locale, creando un delizioso menù con autentici sapori siciliani accompagnati dalla nostra ampia lista di vini, cocktail creativi inventati dal nostro barman, l'intrattenimento fornito da artisti selezionati e fidati, ma anche esperienze ed attività per arricchire il giorno del tuo matrimonio (corsi di cucina, degustazioni di vini, escursioni nelle vicinanze, lezioni di Yoga, escursioni a cavallo, giri in Elicottero sull'Etna, ecc. ): lavoreremo con voi per rendere il vostro evento un giorno speciale ed indimenticabile, un fine settimana o una settimana che voi e tutti i vostri ospiti ricorderanno. Set on the slopes of Mount Etna, Monaci delle Terre Nere is a true love story for owners Guido & Ada, who simply fell in love with the land. Six years ago, they launched it as a luxury country boutique hotel with views of the Mediterranean sea and the famous volcano. Nestled within a 60 hectares estate, it is one of just five eco-certified retreats in Sicily, complete with vineyards, olive groves and an organic working farm, supplying the hotel with home-grown produce, right from the land, at km0. 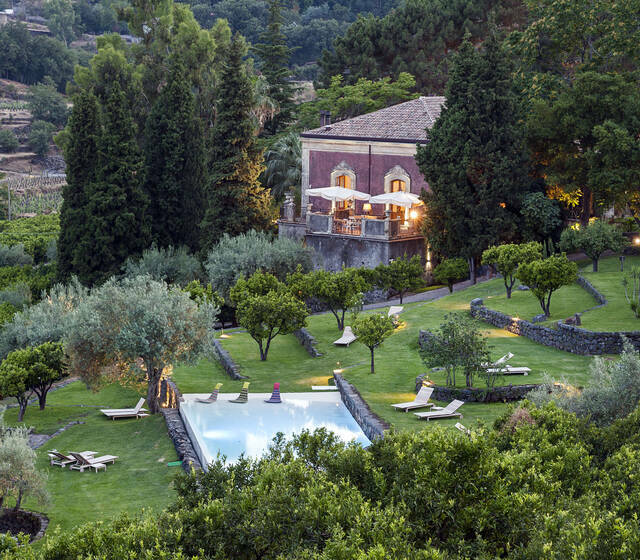 Monaci delle Terre Nere is your perfect destination wedding venue as it offers 23 spacious rooms & suites, an infinity swimming pool, a fine-dining restaurant, a bistrot, a bar, a pool bar, a herb garden, a magnificent terrace and children's playground. The 16 suites and 7 rooms are either located near the main building or scattered around the estate, offering total privacy; they are all elegantly decorated, combining traditional Sicilian Architecture with handpicked furniture and contemporary art, including pieces from the owners' private collection. It is the perfect place for couples looking for a truly unique setting and the peace of mind of having a dedicated team to help make their day unforgettable. From coordinating your ceremony with the local county hall, creating a delicious menu with authentic Sicilian flavours complimented by our extensive wine list, including our own produced wines, inventive cocktails concocted by our creative and critically-acclaimed barman using herbs and flowers from our own gardens (why not create your own bespoke cocktails? ), to ensuring impeccable service under the watchful eye of our Maître D, entertainment by our trusted, handpicked suppliers but also experiences and activities around your wedding day (cooking classes, wine tasting, excursions to nearby sites, etc,): we will work with you to make your special event a day, weekend or week you and all your guests will remember. What can I say about Monaci delle Terre Nere to do it justice? My wife and I absolutely adored this place - we visited it quite a few times now and, without fail, we are blown away by the idyllic scenery, sublime food, delicious wine and the great staff, who always ensure the guests feel welcomed and pampered. Our love of Monaci resulted in us asking Ada and Guido if they did us the honour of letting us hold our wedding in their beautiful grounds and it was definitelythe best decision we ever made!! It's the perfect place where to relax: in summer just staying by the pool and enjoying the sun and in winter curling up with a glass of locally produced red wine and a good book next to a crackling fire. Whenever you go a stay at Monaci will leave you fully refreshed and never wanting to leave. Every time we stayed we had the chance to be allocated in a different room and every time we thought it was perfect: there were all beautifully decorated, exactly as the pictures on their website show. Some of the rooms are a short walk from the main house but the staff is more than happy to come pick you up in a golf buggy (quite the entrance to our wedding!!) Regardless of when we visited, what has never changed was the quality of the food, always served by a beautiful terrace during the sunset. However, I must say, the addition of Monaci's new head chef has taken the food to a whole new level. I can genuinely say that the food at our wedding exceeded all our expectations: it was truly some of the best food we have ever tasted. I would highly recommend the nebrodi pork and, if you can persuade the chef, the cannoli will be the best choice you could make!! Food is so good you won't want to venture far from the hotel! Every time we leave Monaci delle Terre Nere, our first thought is "when can we come back?" and I can guarantee it won't be long before we are back for another stay. A truly magical place that combines the tradition and beauty of the area with the serenity of a boutique retreat!! Location meravigliosa, atmosfera suggestiva, raffinata, romantica ed elegante; cibo eccellente, biologico ed altamente ricercato; personale disponibile e cortese. Servizi di altissima qualità! Raccomando lo chef Bleri Dervishi, che mette anima e suo in ogni suo piatto. È stato un matrimonio da sogno, come lo avevamo sempre desiderato; abbiamo ricevuto i complimenti di tutti. The one my wife and I had at MDTN, was an intimite ceremony. The service and the staff was impeccable for the whole stay and the attention to detail especially on part of the director was very much appreciated. We enjoyed exquisite food and delicious wine and all the ingredients served were from their nearby farm, in Sicily. Everything was perfect. We had the pleasure to stay at Monaci for a wedding weekend in June. We were amazed by the beautiful surroundings and impressed with the food and staff, who was very helpful and kind. There was also a pool area: a very peacefu and quite place where lovely food and drinks were served - a special thanks goes to Alberto for his cocktail making skills! We particularly loved the focus on the food organic production, on the local wine and on the interesting flavour combinations created by the chef. Also the rooms were very nicely decorated and they all had stunning views. This was certainly the best hotel we have every stayed in and we will definitely come back in the future! Scopri le 10 migliori location per matrimonio a Catania, in una cornice naturale tra mare, oasi verdi e l'imponente Etna! Hai mai pensato a un Boutique Hotel come location per il tuo matrimonio? Immergiti nella natura di uno dei luoghi più suggestivi della bella Sicilia e vivi il tuo grande giorno come un'esperienza che non dimenticherai mai. Places of love: la location perfetta per dirsi sì! Scegliete la location delle vostre nozze ascoltando il vostro cuore, seguendo le vostre priorità e sognando in grande: il resto verrà da sé! Anche se non la pensi così, avere a disposizione una squadra di professionisti del wedding può salvare il tuo matrimonio!